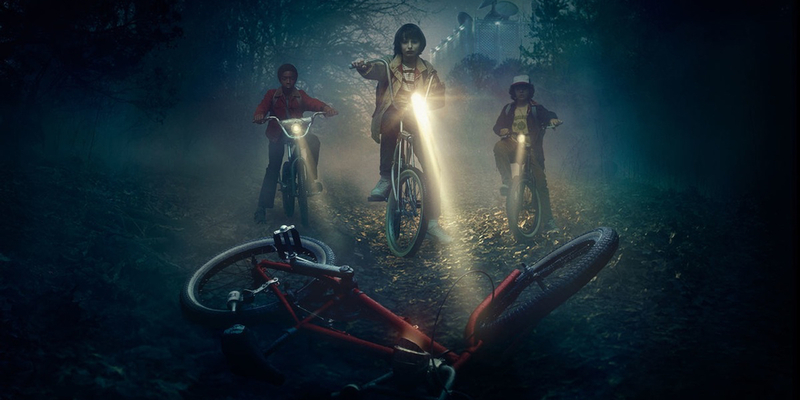 Stranger Things, Netflix's spooky ode to '80s cinema and all things Spielberg, King, and Carpenter has been streaming for nearly two weeks now, and the response has largely been one of admiration for the nostalgia-fueled pre-teen adventure. Along with a heavy dose of film references and a meaty role for Winona Ryder in a bit of meta-casting, the series managed to blend sci-fi and horror elements to tell the story of a close-knit group of D&D-loving kids who stumble upon a psychic runaway, while investigating the mysterious disappearance of one of their friends. At just eight episodes long, the series is a quick binge-watch by Netflix standards. And considering it ends with a epilogue heavily hinting at season 1 being anything but the end of the story, you're probably not alone if you were holding out hope for the series to continue with more installments down the line. And, unsurprisingly, more seasons are exactly what series' creators Matt and Ross Duffer (who operate under the title The Duffer Brothers) imagined when they cooked the idea up. According to an interview executive producer and director Shawn Levy (Real Steel, Night at the Museum) gave to /Film, the plan has been and continues to be to follow the adventures of Mike Wheeler (Finn Wolfhard) and his friends Dustin (Gaten Matarazzo), Lucas (Caleb McLaughlin), and Will (Noah Schnapp) as they deal with the fallout of having played an inadvertent part in close encounter with an interdimensional being, and meeting (and developing feelings for) the laconic Eleven (Millie Bobby Brown), who vanished (but maybe not entirely) in the finale. Winona Ryder Charlie Heaton and Natalia Dyer in Stranger Things. "Yes. The answer is yes and yes. We definitely are hopeful to go several more seasons. And the plan is to continue with this set of characters while introducing a few critical key new ones next season. So I’ll just say that a lot of the big mysteries get answered at the end of Season 1, but we are very much kind of unearthing new problems and questions that merit future stories and future investigation in the most enjoyable way. So we are in love with our cast and our characters. Things end up being resolved to some extent at the end of Season 1, but not entirely. And that’s why we’re so hopeful we get another few seasons to live with these people a little longer." Given how successful the series was in weaving three major story arcs into the overarching narrative, the idea that the Duffer Bros. would want to continue telling the story of not only Eleven and her new friends but also that of Sheriff Hopper (David Harbour) and the maybe-burgeoning affection between Nancy (Natalia Dyer) and Jonathan Byers (Charlie Heaton). Besides, there's a whole other world (the upside down) just waiting to be explored, not to mention a whole host of eerie and flat-out frightening creatures just waiting to find a way into the real world (the right side up?) and everyone's nightmares. The season finale, 'Chapter Eight: The Upside Down,' went to great lengths to underline the notion that season 1 was itself the end of a chapter, not the entire story. And while there are some who were hoping the series might become an anthology, with a whole new creepy story to discover and explore, after eight episodes, the idea of spending more time with Mike, Lucas, Dustin, Will and hopefully Eleven may be enough to bring around even the firmest skeptics. Screen Rant will have more news on Stranger Things as details are made available.